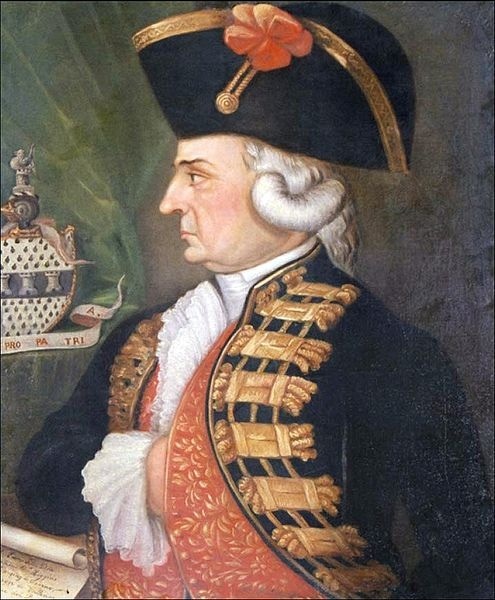 Either on this day in 1801, or tomorrow (the sources vary) Ambrose O’Higgins, Viceroy of Peru, died in Lima. And you think this isn’t Irish History. And in one sense, you would be right. It isn’t. But, and it is an important but, in another way it very much is. Firstly, Ambrose was one of those fine Irish exports, an emigrant in the service of a foreign power. Such service was something the Irish excelled at. Irishmen and women served empires as diverse and varied as Austro-Hungary, Spain, France, Britain and the undeclared but real Empire of the United State of America and many still do. In Ambrose’s case, he ended his days at the top of the pile in Spanish service. Like many before him, he found that the catholic empire of the Spanish was a fertile territory for growth and success. In the years between 1690 and the early 1800s, Europe was much more promising territory for Irish emigres than the United States. It was only as the US economy began it’s rapid expansion and thus demanded many, many more workers that Irish people responded and the patterns of migration changed. There were other factors in this shift too. In the earlier phases, the nature of the emigrant was different. Elites and soldiers populated their ranks rather than families and the less well positioned as made up the largest body in the later emigrations. Secondly, much as Ireland has been heavily influenced by events beyond our borders, and events within our borders have been influential on the world at large, Ambrose and his path show that Irish people themselves have had immense impact on the wider world. The focus of our history should just be on the narrow gauge of our relations with our over powerful neighbour nor indeed merely on the minutiae of events on this small and seemingly isolated island, but in the flow and change of a much broader picture, one Irish men and women were engaged in and actively shifting and shaping throughout the history of the island. Written by: Eoinpurcell on 18 March, 2010.on 4 August, 2010.